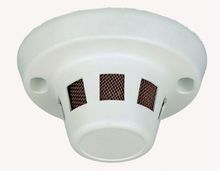 This side view smoke detector can solve a lot of problems. Sees a 90 degree view of everything. Cover any entrance, hallway or work area.The high quality optics will deliver a great video image, even in low light. The camera sees out from the grid. You can adjust the camera angle to some degree. Not really for mounting on walls. All the hardwired models use a camera with a Sony SUPER HAD 1/3 inch CCD. We stock the color with 380 TV Lines and 0.2 Lux and the BW with 420 TVL and 0.1 Lux. Dimensions: 120mm wide and 60mm tall.